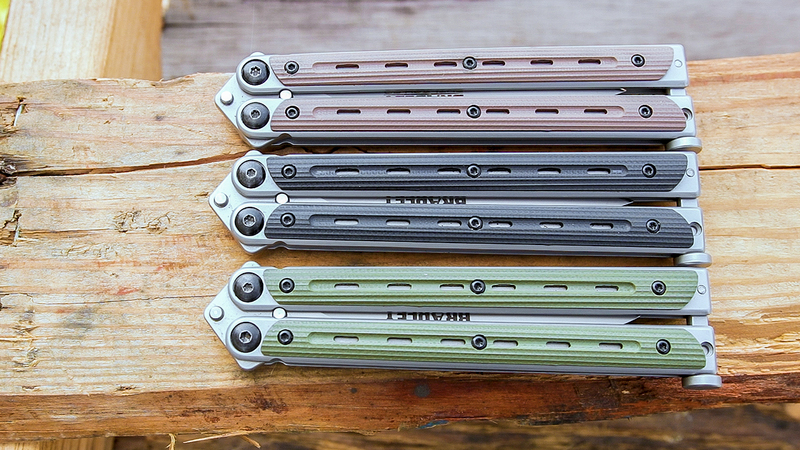 Balisongs, more commonly referred to as butterfly knives have been widely popular for some time now, and it is easy to see the appeal. They have their roots in the Filipino martial arts, but nowadays most people use them to perform tricks. You can see folks showing off their skills in movies and all over the internet. Thing is, it can be an intimidating hobby to get into. 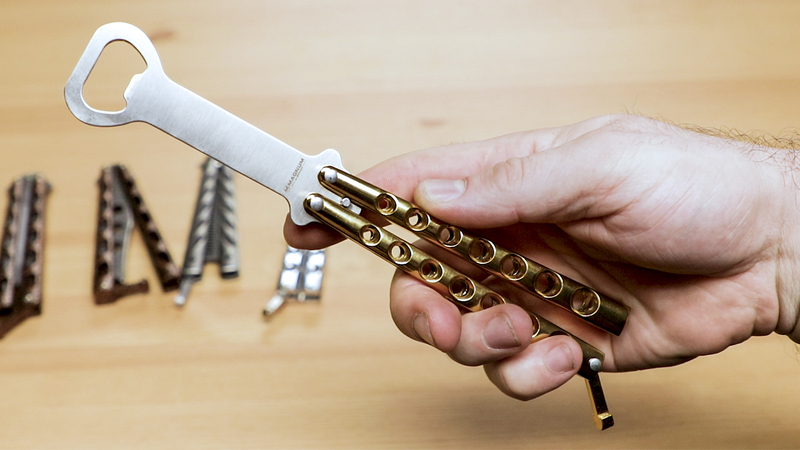 Not only can the tricks be difficult to master, but you also have to decide which butterfly knife to buy to get started. Experienced flippers have a lot of strong opinions on what is good or not, and sometimes it can be hard to sort through. If you are a beginner or even a novice looking to upgrade, we want to make it as easy as possible to enjoy this fun hobby, so here are a few options that range in price and performance that you ought to check out. The first pick is the budget option. For those of you who what to see if the Bali world is right for you but you don’t want to make a big investment right away, we carry a range of options from Bear and Son. These aren’t going to flip like a high-end knife, but there is simply no better way to get started without emptying your wallet. They come in a lot of different handle and blade combinations. We Highly recommend KnifeCenter Exclusive Copper vein handled versions pictured above. The biggest drawback of these knives is that they don’t quite have the adjustability that some of the more pricey butterfly knives on the market. The pivots are pinned and the tolerances out of the box can be a little tight. They do take a little breaking in before they smooth out, but once they do, these are great for learning the fundamentals and to see if it is something you want to keep pursuing. If you’re a bit intimidated about learning tricks on a live blade, another option is to pick up a trainer that doesn’t feature a sharpened edge. On the topic of trainers there is no shortage of those on the market either. They mimic their live bladed counterparts. But there are also options if you want a trainer with a little bit of added utility. Boker Magnum especially has produced some cool offerings that actually flip decently, including a Balicomb, Baliforks and spoons, and it wouldn’t be a proper list if we didn’t include a bottle opener, so here is the Boker Magnum Butterfly-style Bottle Opener. The pivots on these tools are even adjustable. Not only are they a great way to learn the tricks, but they are also a nice conversation starter at parties. 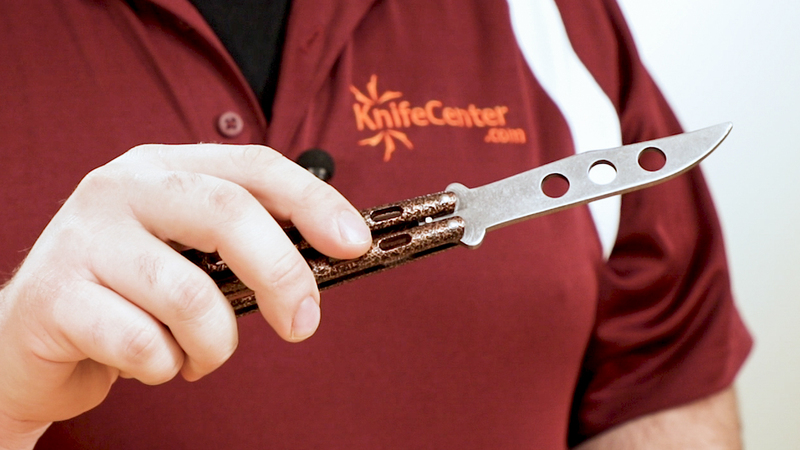 Another great trainer that has become a fast favorite here at the Knife Center is the ArtisanCutlery Kinetic-Tool. 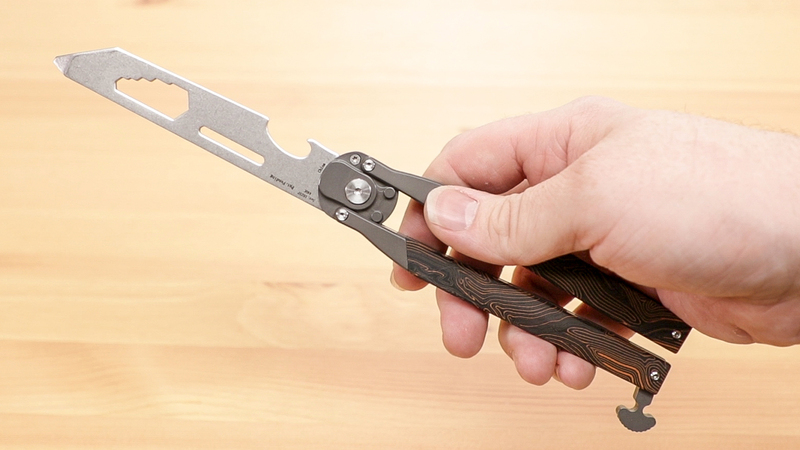 In addition to multi-tool elements, including a bottle opener, this balisong has an added feature that we’ve never seen before, and that is a spring-loaded, automatic “blade”. Even more than the previous bali-tools, this one will really be a hit at your next gathering. The auto function doesn’t interfere with the flipping action, which is actually pretty good. Its single action allows it to spring open or closed depending on your handle position, and you’ve got the hex wrenches, screwdriver/pry bar, ruler, and cap lifter to make it useful beyond the trainer aspect. You can get it with a variety of different colors and handle materials, including this KnifeCenter exclusive black and orange G10 variation which you can only get from us. So what if you are looking for something a little bit nicer? Something that is relatively affordable, but that you aren’t going to grow out of as you improve on your skills? For that, we have the Bradley Kimura. You’re getting solid features that typically cost more, such as adjustable pivots riding on bronze washers. You also get a set of colored G10 scales that are removable so if you prefer to have more traction in the hand or slimmer profile you can modify it to fit your preferences. The blade is a graceful spear point made from 154CM steel which means it actually has performance potential with capable edge retention. We have found these Kimuras to be excellent butterfly knives for the price and it’s perfect for beginners or the novice looking to take the next step, or even more advanced flippers looking for a good extra practice option. It has all the key features that a good balisong needs and it won’t make you cry when you open your wallet. Sometimes you don’t want to make excuses and want to step right up to a higher end knife, one that experienced flippers respect and that won’t let you down. 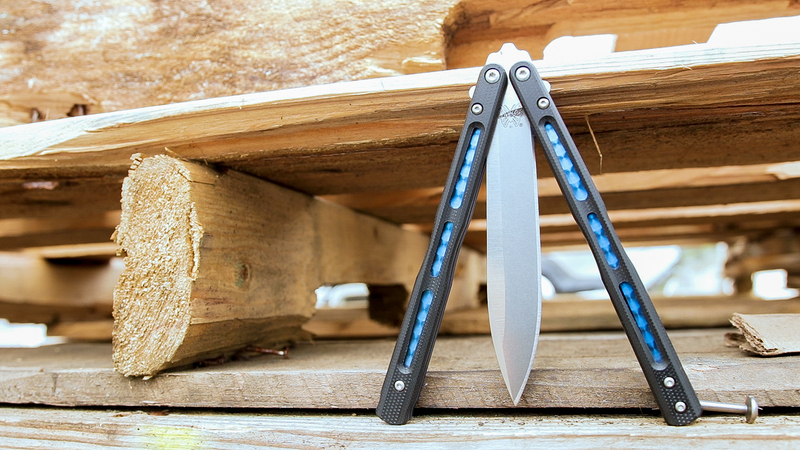 We think the Benchmade 51 Morpho is perfect as it has top-notch construction, precise fit and finish, and smooth action. 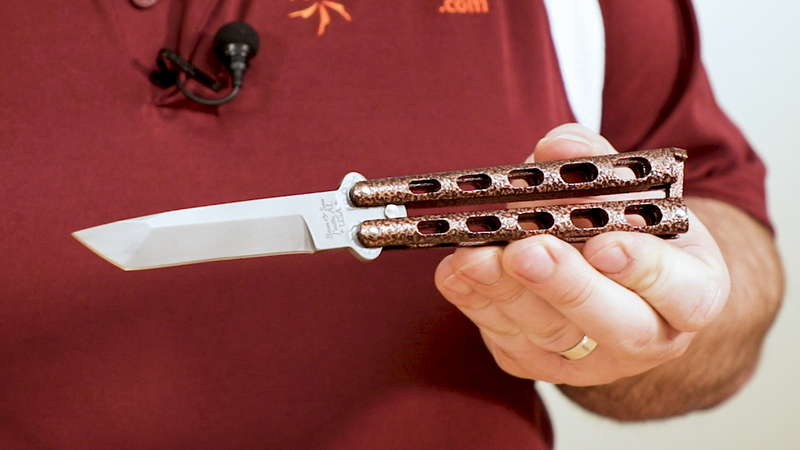 Benchmade’s legacy is directly tied to butterfly knives, they were the first knives the company ever produced, and they make some of the best production balisongs we’ve seen. 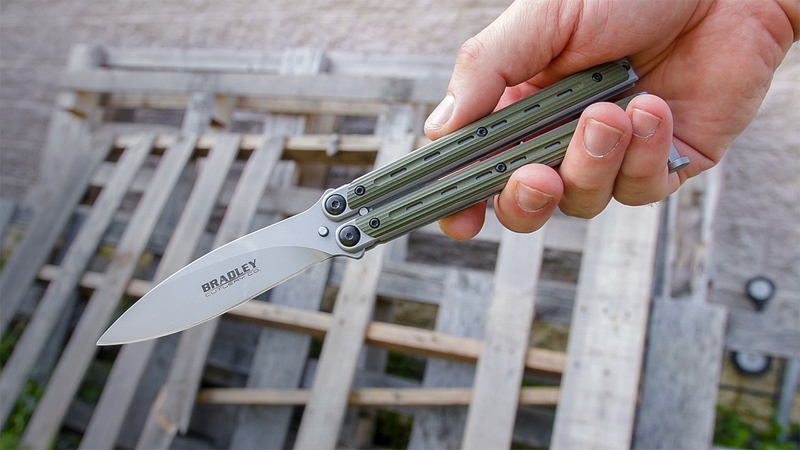 The 51 is on this list because it sits in a really nice sweet spot as the most affordable Benchmade balisong, and is built so well that it really could be the only balisong you’ll ever need. The handles on this knife are made from beautiful jeweled titanium with a blue finish and G10 overlays that help keep the weight down while also providing plenty of traction. It features a spring-loaded latch that is a cinch to disengage so you can get to flipping quickly. The spine of the blade is even crowned for comfort which is a nice touch when it comes to the overall feel. Speaking of the blade, it is made with stonewashed D2 tool steel, meaning even though you’ll primarily use this knife for flipping you can do some decent work if you want to. These are just some of the great beginner balisongs that we carry, and we hope you’re inspired to take up this rewarding hobby. 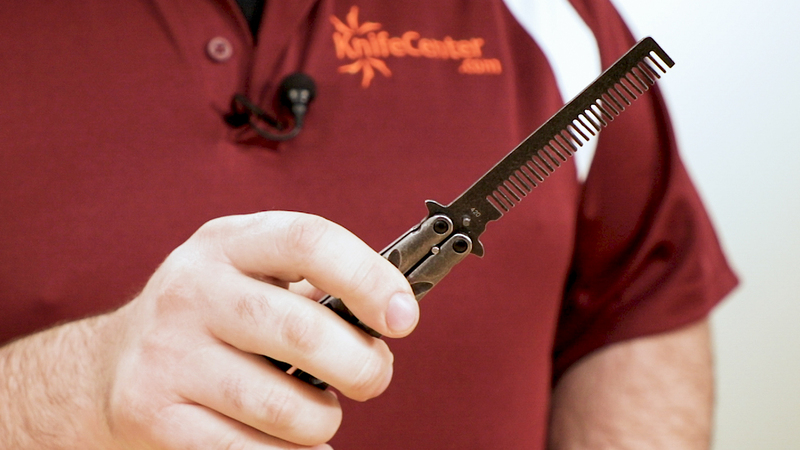 As you grow in your skills and confidence, Knife Center has everything you need when you are ready to step up, from great brands like Benchmade and BRS Bladerunner Systems, and even high-end custom made and collectibles knives. 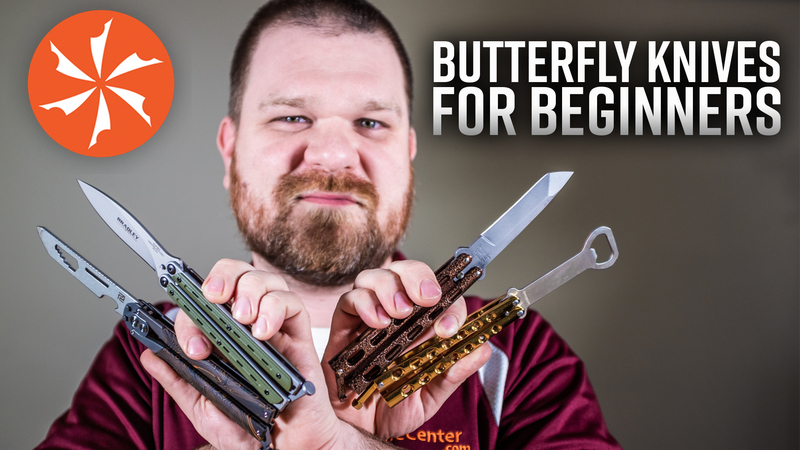 Head on over to KnifeCenter.com to check out all the great butterfly knives that we carry, including all of these best beginner’s butterfly knives and more!